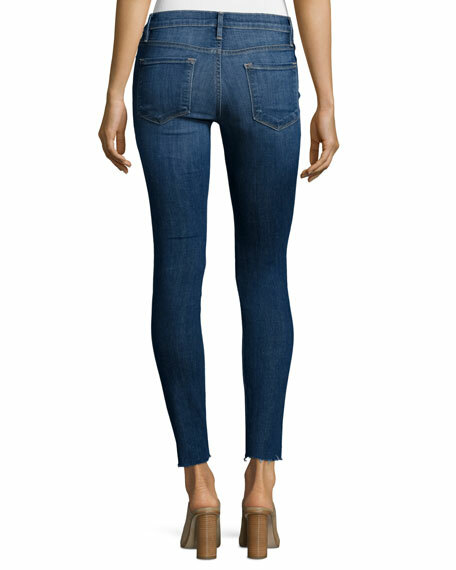 FRAME "Le Skinny" jeans in stretch-denim. Whiskering and distressing at front. 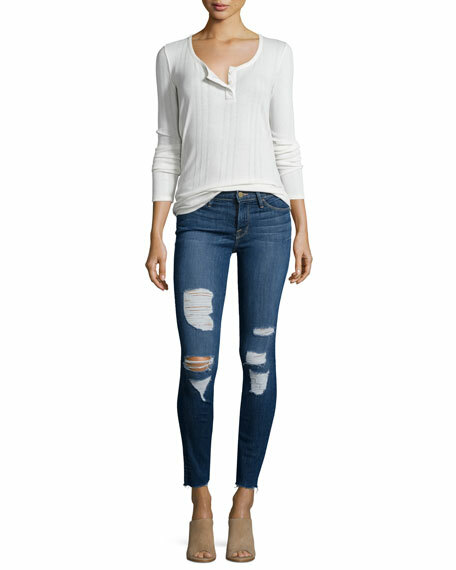 Cropped at the ankle; raw-edge hem. Manufactured in L.A. with a London sensibility, this brand is known for creating effortless perfection in denim. FRAME jeansin a range of cuts that includes wide-leg, boot-cut, vintage flare, super skinny, and even gauchoare executed with meticulous attention to detail. Since its founding, the FRAME line has expanded into ready-to-wear, extending the same fabric-first approach to everyday apparel. From jeans to tops, jackets, and blouses, FRAME designs are meant to be lived in. For in-store inquiries, use sku #1817233.